It is possible to get an accelerated recovery of the water accumulated in the plaster moulds during the thickness making phase, which makes workable to perform many castings with the same mould in a day. To realize this process it will be sufficient to install a MULTITASKING TUNNEL on the bench where the moulds are fitted. The tunnel consists of a thermodynamic systems for drying the moulds. Different laboratory tests have been performed with special tools suitable to read the movement of the particles of water inside the plaster discovering that normally the water entering inside the moulds (which form the thickness) is also drained through the same side. It must be noticed that the widespread reassuming of water between the plaster inside and the evaporating surface is considerably linked to the increasing of the humid bulb from 32°C to 44°C (upgrading of the molecular vibration with consequent smaller kinematic stickiness. As a matter of fact it has been detected that at least 3 consecutive castings are necessary for getting the water entering the whole surface of the mould. Besides being a perfect system capable to close and open automatically so as to form a natural drying chamber, the tunnel is also equipped with motorized arms suitable to feed the air directly on the humid surface of the moulds. This feature allows an almost total recovery of the water absorbed for forming the thickness of the mould in a 2-3 hours time. 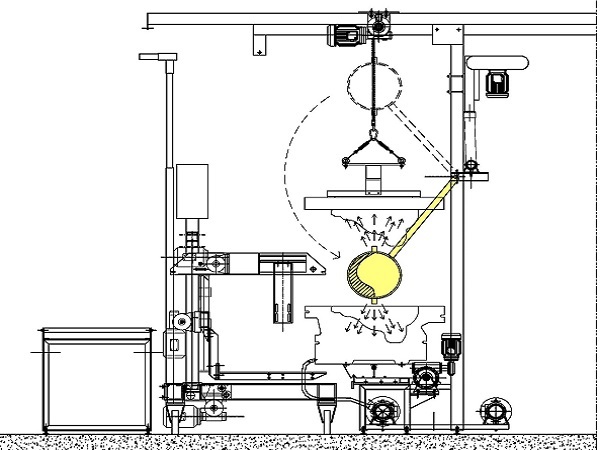 The efficiency generated by the thermo-hygrometric condition is about four time over the normal condition of one unique casting get in a good conditioning system during the night cycle. No danger of transformation of the bi-hydration in anhydrous has been observe d due to the fact that the adjusting of °C and UR% allows to keep the plaster temperature under 50° to get the hydrometric balance with the temperature of widespread water on humid bulb.